Evenly cook nine delicious kebabs without flipping and losing precious niblets. 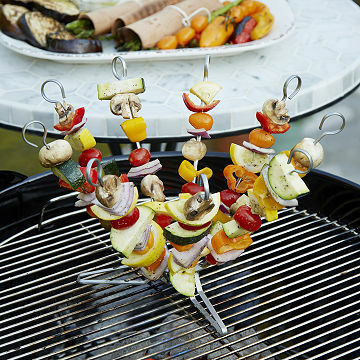 Skewer system or food merry-go-round? We like to think it's both. This stainless steel design was invented to evenly cook those delicious kebabs you crave. Gone are the days of burning your hand or losing precious nibbles in flipping mishaps. Load up the skewers, pop it on the grill or in the oven, let it cook. Pro tip: use the skewers to cradle a whole pumpkin or squash for super simple grilling or roasting. And Vegetarians: You'll love that your kebabs won't touch the grill, where meat contamination is unavoidable. It makes a great gift for foodie friends who know that everything tastes better on a stick. Made in India. Dishwasher safe or clean with warm water and dish soap. Includes 9 skewers, stand, and storage bag.